- Bust/ waist/ hips circumference in inches or cm. - How tall are you. 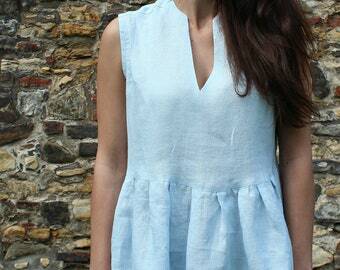 Pure linen sleeveless jumpsuit is perfect for summer outfit. The lightweight fabric is breathable and loose-fit is super comfortable. - Length: 130 cm/51" (we can make it longer or shorter). 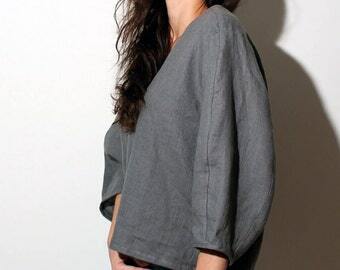 - Made from 100% linen. Absolutely eco-friendly and high quality natural European linen (Oeko - Tex quality). - Low waist and wide cropped leg. - Waist emphasized with a belt. - Fastens with a zipper on the back. * Colors may differ slightly from photos due to different monitor settings. We will sew this jumpsuit for your measures. Choose the size that is closest to your measurements. Chest - 80-84 cm/ 31.5-33"
Chest - 85-89 cm/ 33.5-35"
Chest - 90-94 cm/ 35.5-37"
Hips - 95-99 cm/ 37.4-39"
Chest - 95-99 cm/ 37.4-39"
Hips - 100-104 cm/ 39.4-41"
Chest - 100-104 cm/ 39.4-41"
Hips - 105-109 cm/ 41.3-43"
Chest - 105-109 cm/ 41.3-43"
Hips - 110-114 cm/ 43.3-45"
Chest - 110-114 cm/ 43.3-44.9"
Hips - 115-119 cm/ 45.3-46.9"
Chest - 115-119 cm/ 45.3-46.9"
Hips - 120-124 cm/ 47.3-48.9"
Chest - 120-124 cm/ 47.3-48.9"
Hips - 125-129 cm/ 49.2-50.8"
Ready to ship in 3-5 business days. Shipping worldwide by registered airmail is 16$. - Standard shipping usually takes 14-28 days (Italy and Germany 14-45 days). Please, mail us with any questions. UPS Express shipping to USA only available in checkout in shipping upgrade (2-4 business days). Beautiful paper and silk satin ribbon. This is a fabulous jumpsuit, exquisitely tailored! My husband responded with "I love it!" the moment he saw me in it, and I know that I will be getting many compliments and questions (Where did you get that?) Julia is very easy to communicate with and responds quickly. I asked to have the standard size modified for my proportions and am very happy with how I look in it. The colour I chose, Kale, is deep and sensual and looks beautiful with gold earrings. The blouse part of the jumpsuit is fitted and very flattering, and the bottom half is loose and carefree. It is a good combination. There is one small issue, and that is that my bra shows a bit. I know, though, that if I wanted to order another one in a different colour, Julia would make it perfect. The package to Canada took a month and 5 days, so plan accordingly. So beautiful design, this jumpsuit, and so well made! This piece of clothing was originally for my daughter, but eventually it was too big for her, so ... it's for me! And I'm really, very happy to have it just for me! Wonderful Work! I will surely order another one in a different color! Beautiful jumpsuit, excellent craftsmanship, fast shipping! Beautifully made and fit perfectly! I gave Julia my measurements and specifications and she succeeded in giving me what I wanted. Thank you! I accept payment through Paypal (you don't need to have an account) by credit or debit card. If you choose to pay through PayPal, you'll be redirected to a secure PayPal page and then back to Etsy to confirm the order. - Click Check out with PayPal and you’ll be redirected to PayPal. Instead of choosing to pay with your PayPal account, select Pay with Debit or Credit Card. - You'll be prompted to fill in your billing and credit card information. - Enter your email address so PayPal can send you a receipt. - Click Continue to return to Etsy. Your payment isn't sent until you click Submit order on Etsy. You can change length of item, add sleeves, pockets, etc. I always contact buyers after the purchase to clarify the size and measurements. All clothes create with your measurements. If you would like to make present to somebody, use our size guide. Please, mail me, what item are you interesting in, how many pieces you would like to order and I will count price and shipping.